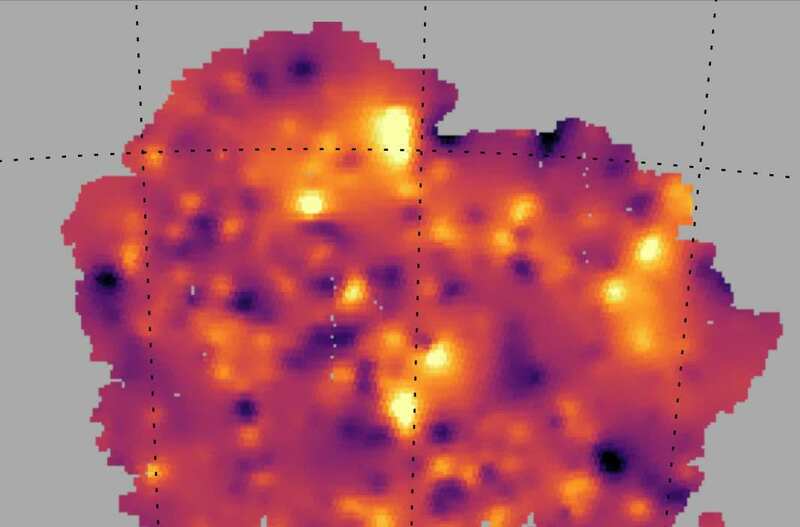 A team led by University College London (UCL), in collaboration with the Astrophysics Department of CEA-Irfu, has significantly improved the analysis of dark matter maps in the Universe with new methods of data analysis. The maps produced by this analysis demonstrate the power of these new innovative methods for analyzing future large data sets such as those expected from the upcoming EUCLID cosmological mission. These results are published in the MNRAS journal. With more accurate maps of the Universe, it will be possible to better understand the properties of Dark Energy (the unknown cause of the acceleration of the Universe) and Dark Matter (the 80% of invisible matter in the Universe). Dark matter maps are made by analyzing the shape of thousands of background galaxies that are distorted by this invisible matter. The gravitation, due to the foreground dark matter present on the line of sight, deviates the light coming from the galaxy acting as a deforming "lens". This effect, called "weak lens", is currently an invaluable technique for studying the Universe. But it requires very fine analysis of the shape of many galaxies often very distant. To test new methods of image analysis, researchers used an existing catalog, the Dark Energy Survey (DES) containing 1.6 million images of galaxies. This catalog had been previously used, which made it possible to measure the progress made. The new methods introduce a priori knowledge of different theoretical models to improve the quality of dark matter maps. According to Niall Jeffrey, a PhD student at University College London who coordinated this study, “Applying new data methods allows us to ‘see’ dark matter structures more clearly and create better maps of dark matter.” The Big Data methods used to create these enhanced maps also have diverse applications far beyond cosmology, such sas environmental satellites, medical imaging, and countless optimization problems. The work was done in collaboration with the H2020 European DEDALE project — a multidisciplinary European collaboration, leaded by Jean-Luc Starck at CEA, which designs novel techniques for analysing large and complicated data sets. Professor Ofer Lahav (UCL Physics & Astronomy), co-founder of DES and co-director of the UCL Center for PhD training in intensive scientific data, comments: "We observe the remarkable growth of galaxy surveys, starting from catalogs of some thousands of galaxies just 30 years ago. to reach hundreds of millions with the Dark Energy Survey (DES) today and billions with the next generation of surveys. The maps produced in this work demonstrate the power of new innovative methods for analysing future huge data sets.” Jean-Luc Starck of the CEA Astrophysics Department, co-author of this work, adds:" the progress in the image analysis are such that, we can now solve data analysis problems we believed not possible to solve few years ago". An invaluable bonus to decipher the Universe! "Improving Weak Lensing Mass Map Reconstructions using Gaussian and Sparsity Priors: Application to DES SV"